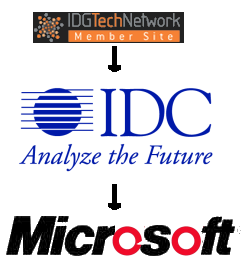 IT WAS only a few days ago that we remarked on the IDG-Microsoft relationship, which is based on IDC right there in middle. We don’t trust IDG, despite that fact that its reporters occasionally reference Boycott Novell (twice this week). There is no black-and-white, but there are tendencies to cover certain stories (or aspects of them) more frequently than others. That’s just the known formula for biased journalism, and it’s by no means a problem that affects only technology reporting. To be fair to all the Web sites that are listed in the headline, their advertisers have little effect on the content, with the exception of the advertising space. That’s what Michael Larabel told me when he thought hard about whatever to cede some control of his excellent Web site, Phoronix. “There is no black-and-white, but there are tendencies to cover certain stories (or aspects of them) more frequently than others.”A few hours ago we found out that OStatic too had become part of the IDG network. This triggered some red lights because the site advertises a lot of Novell technologies in the form of promotional articles advocating its technologies, e.g. Mono, Go-OOXML, OpenSUSE. OStatic is owned by GigaOM, which was founded and run by Om Malik. When Om Malik took money from Microsoft to recite its slogan in his writings (without disclosure), it truly gave away some clues, not to mention consequent interviews that he had with chief Microsoft staff. Another news site (and paper publication) that sports the IDG TechNetwork logo is SD Times. For a change which is refreshing, GNU has just made the front page of the SD Times, but a lot of Microsoft adverts are in there, along with praises for Microsoft’s pseudo-open source (imposed confusion to dilute vocabulary, baffle, and obfuscate). Before anyone claims hypocrisy, Shane and I have already blocked domains like microsoft.com, moreinterop.com and novell.com and since Shane pays the hosting bills, the Google ads stay. It’s hard to control their content because Novell and Microsoft, for example, have loads of partners who sell their products, so the adverts come from to a large number of different domain names that we can’t determine. It’s like playing whack-a-mole with domains names which try to sell Novell and/or Microsoft products. It’s impossible. You also won’t have to worry about Vista if you buy one of Apple Computer’s Macintosh computers, which don’t run Windows. Every mainstream consumer doing typical tasks should consider the Mac. …[T]he WSJ actually mentioning a non-Microsoft product. I’m going through articles now and finding that they tend to put the really damning material at the back after padding the front with crap, opinions. For example, this one. I’m compiling a Vista Failure Log, but it’s taking too long. Most articles on Microsoft Vista slam the pile of [***] “product”. Aren’t Warren Buffett, Gates’ parent’s friend and investor, and Melinda Gates, his wife, still on the board of directors for WSJ? I knew about the Washington Post and New York Times. Google ads add comedic value, e.g. the Virgin Media ads on this post.